When you are facing mounting debt and can’t afford to keep up the payments, you need bankruptcy solutions that will provide you a measure of relief from creditor harassment. A Forsyth County bankruptcy lawyer should be consulted from The Sherman Law Group in order to obtain the information you need regarding your legal rights. Federal and state laws allow for consumers to be protected from creditors when they have no way of repaying their debts. 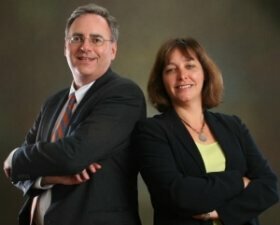 Our legal team composed of husband and wife Bill Sherman and Valerie Sherman have over 50 years of combined experience in the field of bankruptcy law. We are focused on providing our clients with the caring and dedicated legal advocacy they need during this difficult time in their lives. While bankruptcy may be right for some people, there are alternatives to bankruptcy which include settling or negotiation your debt instead of filing for bankruptcy. Whichever process is right for you, you can feel certain we will explain the bankruptcy process, dispel any bankruptcy myths you may have heard and proceed with helping you choose the right option for your specific circumstances. Contact Our Bankruptcy Team for a Free Consultation! By filing for bankruptcy or retaining our firm, phone call harassment must stop. Your creditors will no longer be able to continue to contact you and attempt to collect on the debt. This will effectively stop repossessions and wage garnishments. Once your bankruptcy is filed or we have initiated debt settlement, we can even help you with credit repair. Find out more about what we can assist you with by contacting our office today. Contact a Forsyth County bankruptcy lawyer for help with your mounting debt.